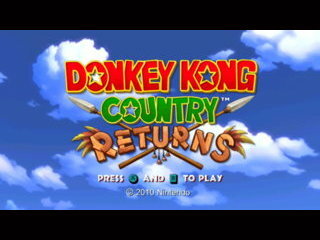 Released in November 2010, Donkey Kong Country Returns features the return of the original duo, Donkey and Diddy, in their quest to once again retrieve the golden banana horde. Recognizing some of their past errors, the duo chooses to ignore water levels this time, a choice which Cranky should endlessly berate them for in the credits. Back in his day, you didn't have these new-fangled motion controls, and had to hold your breath for minutes at a time while dodging exploding fish and cartwheeling octopi. I have improved upon most of the stages in this game since my first submission to SDA well over a year ago. The majority of these strategies are the ideal/best strategy for each stage. I actually competed against someone who was playing the game on an emulator and we both learned a lot from each other. Having a tool assisted time to shoot for on a large number of these stages really helped me set my goals for each stage. Several of my individual level times are actually within a few frames of the best possible time. I put a lot of time and energy (literally with all of the shaking that this game requires) into this run and hope that it shows in the quality of play that I was able to maintain. I may consider trying a SS any% run sometime soon. I also wanted to note that all of the deaths that you see in these runs are intentional. There are a few stages where dying right at a checkpoint can save you time because when you are placed back into the game, the in-game timer doesn't start immediately. I only did this on a handful of stages or so. It is most commonly used in the rocket barrel stages, but I was able to find a couple of the traditional stages where it helped shave off a couple tenths as well. Also, all of the spots where I take a hit from an enemy or object are intentional and were done so in order to save time. Thanks for anyone who wants to help verify these runs and to SDA for hosting them.